If only we had a crystal ball, perhaps we could tell you the future of charter schools in California. What policies might change for charter schools? What are charter schools, again? How quickly are charter schools growing? Who lobbies for and against charter schools? What bills relate to charter schools in 2017? A heated debate is underway in the California legislature about the future of charter schools, and there are important issues at stake. Will it be harder or easier to create more charter schools? What policies should charter schools follow to make sure students do not face discrimination in admissions, suspensions, and expulsions? Will there be more requirements for accountability and transparency in how charter schools are run? Should charter schools be permitted to operate as "for profit” organizations? Charter schools are tax-funded schools that operate with somewhat fewer regulations than "regular" public schools. In California, charter schools currently serve around 580,000 students, about 9 per cent of California students. The number is growing steadily. 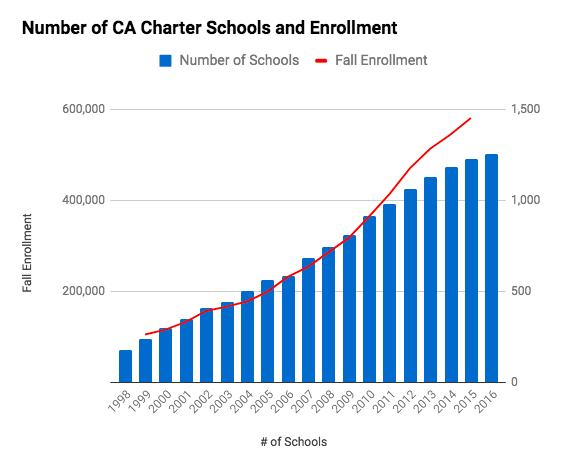 The California Charter School Association wants to reach a million students by 2022. The California Teachers Association (CTA) through its Kids Not Profits campaign calls for "more accountability and transparency of California charter schools" The campaign seeks to "expose the coordinated agenda by a group of billionaires to divert money from California's neighborhood public schools to privately-managed charter schools." The California Charter Schools Association (CCSA) has a well-funded, robust advocacy effort to support charter schools through legislation and local school board elections. It supports a major charter school conference to "inspire academic excellence, operational integrity and unity among charter schools throughout California." Both organizations propose their own bills that shape the future of charter schools in California as they want to see it. Wonk Alert! We usually steer away from technical language about legislation, but this post gives you the chance to dive a little deeper. What do you think? Who should decide whether to approve or renew a charter school? Should charter schools be authorized by the local school district? The county? The state? You might think this is a technical issue. But the answer can mean more or fewer charter schools. The teachers unions and their allies want more decisions made by local school boards. Charter school advocates want alternatives to local school boards for these decisions. SB 808 (Mendoza), co-sponsored by the teachers unions, requires all charter school petitions to be approved by the governing board of the school district where the charter school is located and limits appeals to claims of procedural violations. AB 950 (Rubio), sponsored by the California Charter School Association, greatly expands the role of county boards of education and the State Board of Education in authorizing charter schools. AB 1224 (Weber), also sponsored by the California Charter School Association, establishes a pilot program to allow a few county boards to authorize and oversee some additional charter schools. "Local school boards are the most knowledgeable about the education programs and needs within their jurisdictions... A growing number of charter schools operate within the boundaries of a school district that did not authorize the charter school. This impacts oversight, accountability, average daily attendance funding, and vote dilution for the parents and students of the district." From Senate Education Committee staff comments summarizing the position of the bill sponsors. "A consensus has emerged across public education in California that there is substantial dysfunction within the authorizing and oversight of charter schools…. The current process relies almost exclusively on local school districts as the primary authorizer. This structure creates an inherent conflict of interest in which districts must approve and oversee the entities that may be seen as "competing" for pupils and their associated revenues, removing objectivity from their chartering role." -- Assembly Member Weber, as quoted in analysis of AB 1224. The debate is not just about "who" should authorize charter schools. There are also differing opinions on "for profit" charters, accountability and conflicts of interest, as well as school facilities. One area of agreement is that charter schools should not discriminate in admission policies and should have fair policies on expulsions and suspensions. Let's take a quick look at those bills. "If the goal of a for-profit corporation is to maximize profit for the corporation's shareholders, then the Assembly should consider whether it is an appropriate use of state taxpayer dollars for for-profit corporations to operate public schools. Additionally, does this for-profit model provide a perverse incentive for these charter schools to limit services for students in order to increase profits?" SB 806 (Glazer) is the California Charter School Association bill that addresses for- profit charters. It also says a charter school shall not operate as, or be operated by, a for-profit entity. But here is where it differs: It prohibits for-profits from engaging in specified charter school governance---and authorizes nonprofit charter schools to fill up to 50 percent of their positions that serve pupils with employees of for-profit entities. More details in the Senate analysis. AB 1360 (Bonta), co-sponsored by a long list of organizations, including The California Teachers Association, prohibits a charter school from establishing discriminatory admission policies, and requires suspension and expulsion policies that guarantee all students appropriate due process. According to CTA, this bill would ensure that "charter schools – as part of our system of public education – provide fair access to all students." Two reports, Unequal Access: How Some California Charter Schools Illegally Restrict Enrollment and Charter Schools, Civil Rights and School Discipline highlight some of the issues. Initially opposed by the California Charter School Association, negotiated language in the bill has secured their support. AB 1478 (Jones-Sawyer), sponsored by the California Teachers Association, requires charter schools and any entity managing a charter school to comply with the same conflict of interest requirements as school districts. SB 806 (Glazer) offers the California Charter Schools alternative on conflict of interest. SB 765 (Weiner), supported by the California Charter Schools Association, requires school districts seeking to sell, lease, or jointly occupy property for non-educational purposes to first offer the property to a charter school, except property intended to be used for teacher housing. The bills that change "who" authorizes charters and the "conflict of interest" bills are on "hold" for now, but they can be looked at again in January. Expect lots more discussion about these issues. The other bills will be heard in legislative committees as discussion continues on these topics. You can find out more about each of the bills by clicking on the linked bills above. This takes you to California legislative information. Look under "bill analysis" to find out who supports and who opposes each bill. Under "status" you can see where the bill stands in the process.